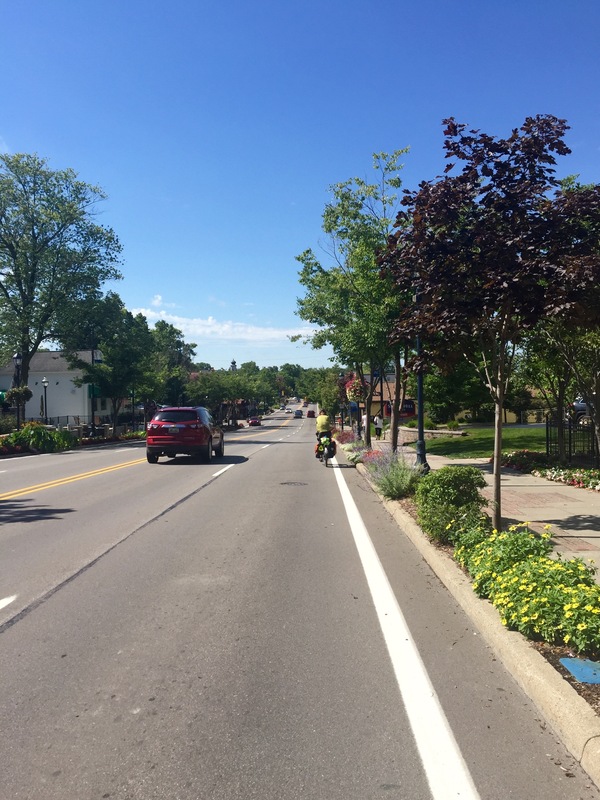 Day 51, 8/1, Bay City, MI to Wadhams, MI: 118.7 miles, 2,008 ft elevation gain, 12.8 mph average speed. 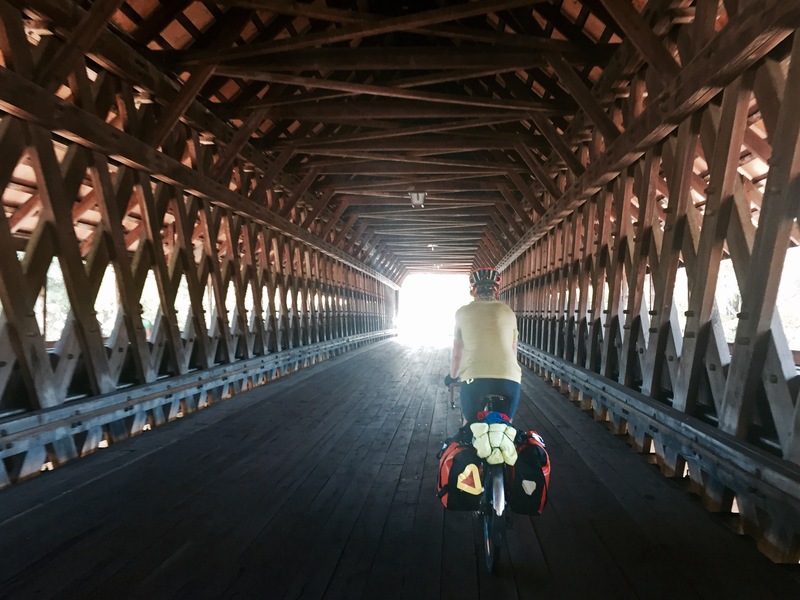 Trip totals: 3,230.5 miles (73.4 mile daily average), 129,114 ft elevation gain, 12.5 mph overall average speed. When you’re bike touring, hotels and motels are fantastic in the evening but less great in the morning. In the evening you’re spoiled by electricity, showers, TV, internet, a refrigerator, and sometimes even an indoor pool! But then these luxuries keep you up way later than your 10:00p bedtime and then the alarm goes off way too early in the morning. We woke up, reluctantly, around 5:45 this morning. We laid around for a while before we pulled ourselves out of bed, and then we went straight to the hotel’s breakfast, which was surprisingly delicious, especially because Dani has taken to toting her favorite salsa around with her everywhere she goes. After breakfast we threw all of our bags on our bikes and headed out the door. Sounds simple, but somehow close to two hours passed between waking up and starting the day’s ride. We then promptly got lost navigating our way back to the ACA route. It was my fault. I’m just not used to cities with multiple bike paths. I figured that any green line I saw on my Google maps app was the one we were supposed to be on. It wasn’t. In any case, we didn’t really get lost as much as took the scenic route through the industrial part of the city before we managed to find the route again. The first half of the morning was mostly southerly with a few short jaunts east. The ACA route/US Bike Route 20 was a little wacky again today, taking us southeast for a while, northeast for a while, and then back southeast again before finally turning primarily eastward. I think the reason for that detour southwards was that the powers that be wanted us to visit Frankenmuth. 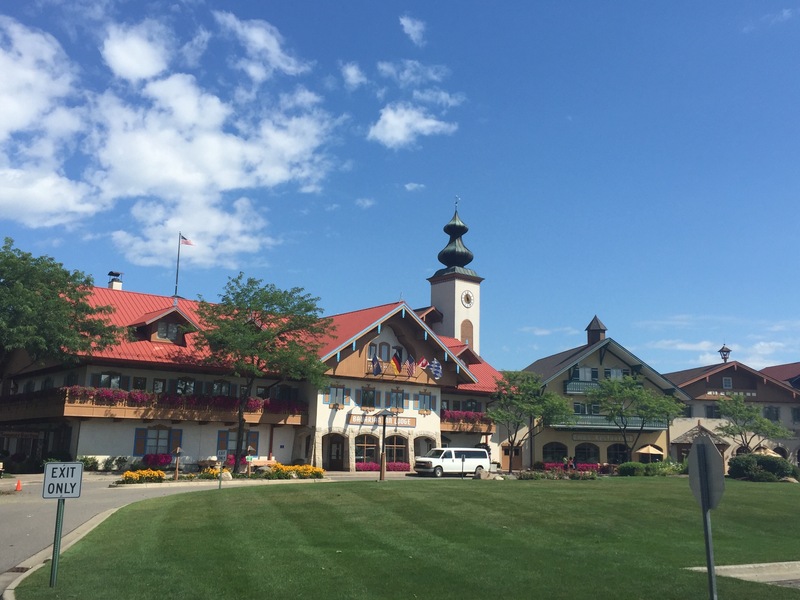 Frankenmuth is a lovely little Bavarian-themed tourist town that looks like it was plucked straight out of Germany (says a guy who’s never actually been to Germany). 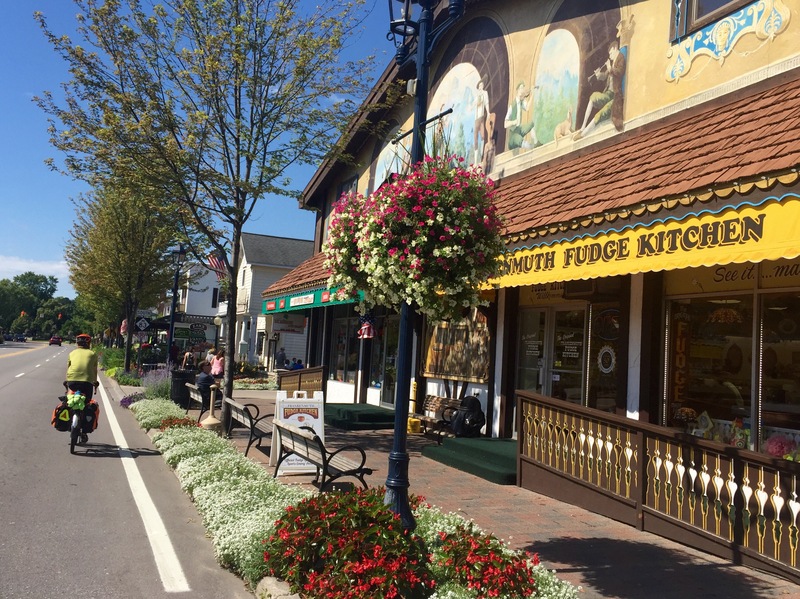 We stopped at the Frankenmuth Kaffee Haus on the main street for second breakfast and a mid-morning pick-me-up. 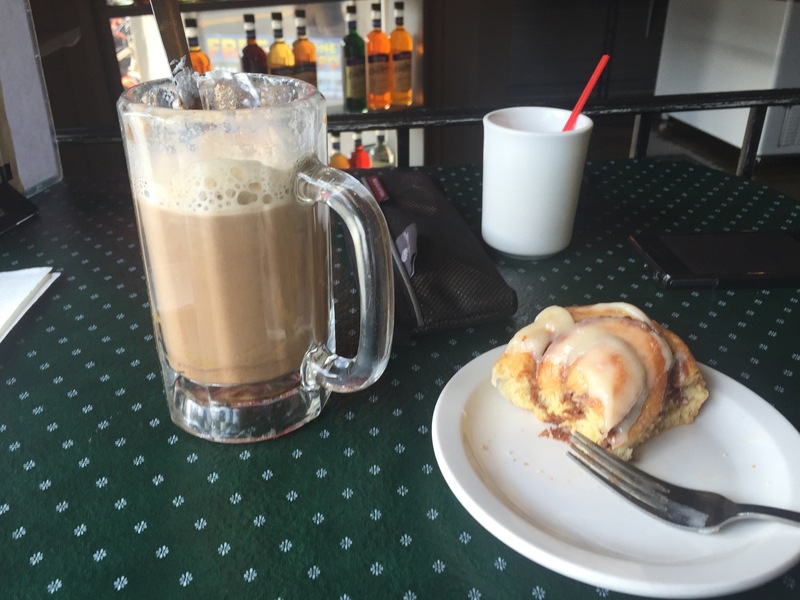 I had coffee and a grilled ham and cheese sandwich, and Dani had a cinnamon roll and an amazing drink called the “Reese’s Revenge,” which included espresso, whole milk, peanut butter, Giardelli chocolate syrup, and whipped cream. The people working here were incredibly friendly, and came over to chat with us about our trip and New York, and to offer Dani a fresh round of whipped cream for her drink. 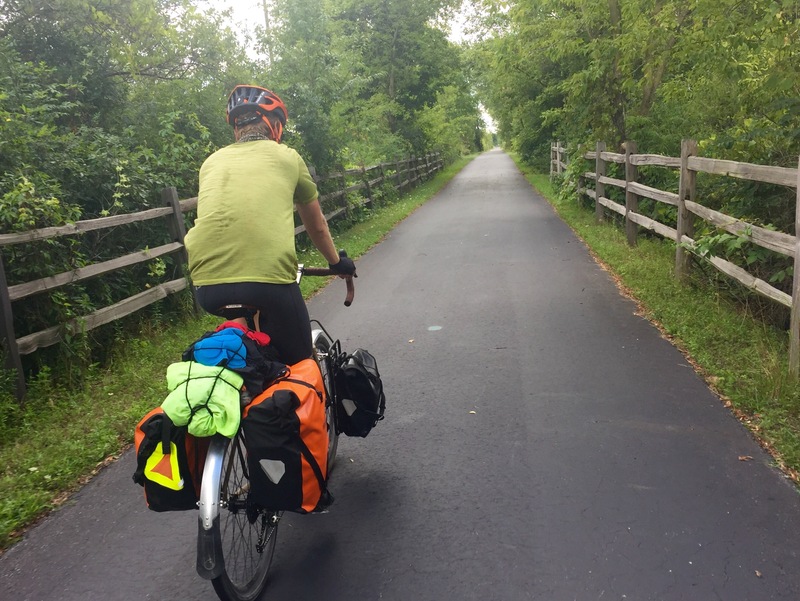 After Frankenmuth, we headed back northeast, enjoying a direct tailwind and speeding through Vassar and to Otter Lake, where we met Dan and Tom, two gentlemen who were touring around Michigan for a few days. 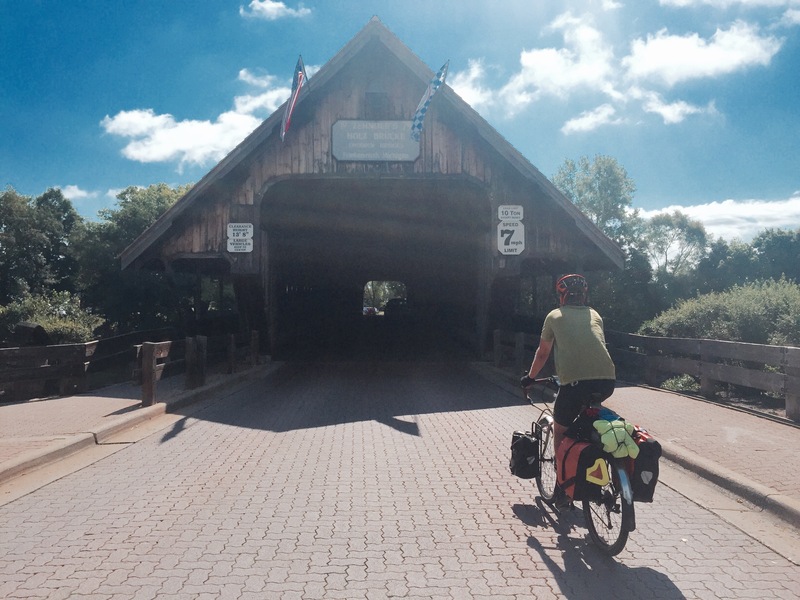 Tom was a tour leader for Bike Centennial, the cross-country trip in 1976 that begot the Adventure Cycling Association, and when he retired at 65, he biked a loop around the U.S., then up through Canada to Alaska. 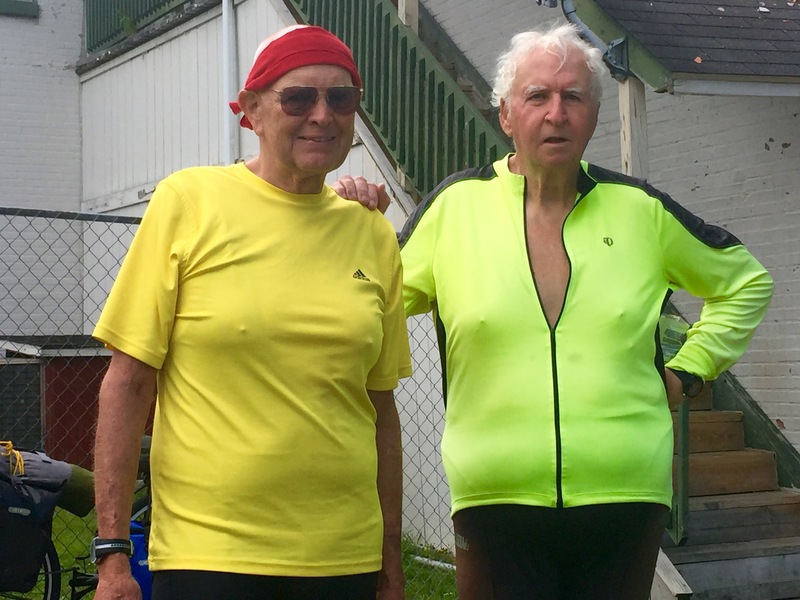 This man’s got at least 39 years of bike touring under his belt, and he told us that he won’t let his age get him down. We keep meeting people in their 40s and 50s who say things like, “if only I were younger, then I’d do a trip like you guys, but I’m too old now.” Dan and Tom, and all of the other 65+ folks we’ve met on this trip (which is the majority of other bike tourists we’ve met, by the way), go to show that this perception isn’t necessarily accurate. Cycling is a low-impact activity with tremendous health benefits. You don’t have to be young or particularly fit to do it; it keeps you young and gets you fit. All along the trip today, we saw broken branches and other debris strewn along and next to the road. We also learned that the power went out in all of the small towns surrounding Bay City and saw lots of utility trucks working on power lines. We didn’t really need any convincing that staying in a hotel last night was the right decision, but it did make us grateful that we made the right decision. From Otter Lake, we pedaled to North Branch, where we bought cold drinks at a gas station next to the library and then sat on a bench outside the library to eat peanut butter and jelly sandwiches on pretzel buns. The library was closed due to power issues (from the storm), and a veritable parade of people drove up and started walking toward the door only to stop short in surprise and walk confusedly away. It was nice to see that the public library in this small town gets such regular use. The wind was on our side after lunch and we cruised down the road, averaging 18-19 mph for an hour and a half until it was time to turn south again, and head toward Yale. A few miles away from Yale, we were sprinkled on for less than 10 minutes. I feel almost sinful for how fortunate we’ve been with weather this trip. Our luck is bound to change eventually, but this was the second time in 52 days that we’ve felt raindrops while riding our bikes. And both times have been light sprinkles for just a few minutes. By the time we made it to Yale, the drizzle had stopped completely. We quickly ran into the grocery store to pick up canned soup for dinner (it was a long day, and we didn’t have energy for anything more complicated), orange juice, and some clearance-priced chocolate milk, which turned out to be above average. Then we packed up the groceries and pushed on. 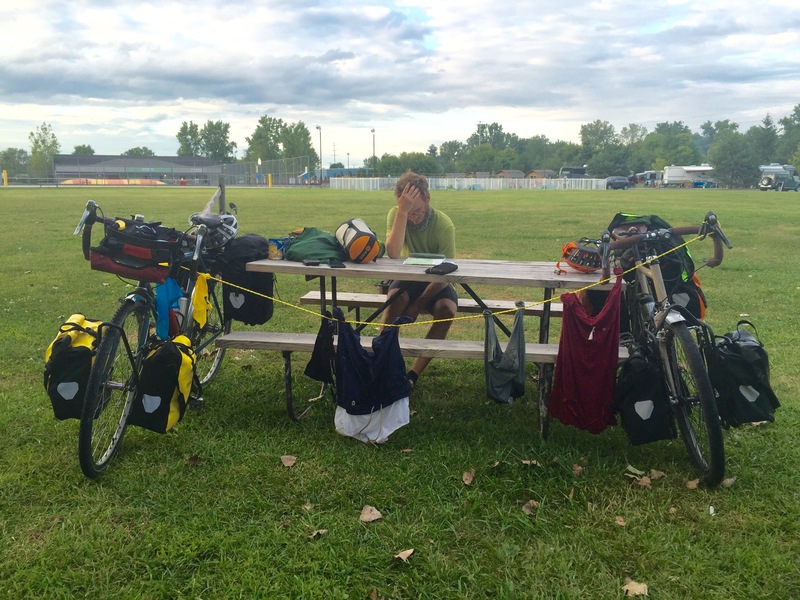 We were feeling pretty good after 95 miles, but we still had 20 more miles to make it to our campground. Round about mile 108, our energy levels tanked. It was also around this time that we realized that the first campground on the map didn’t accept tent campers, and we had an extra three miles to bike. 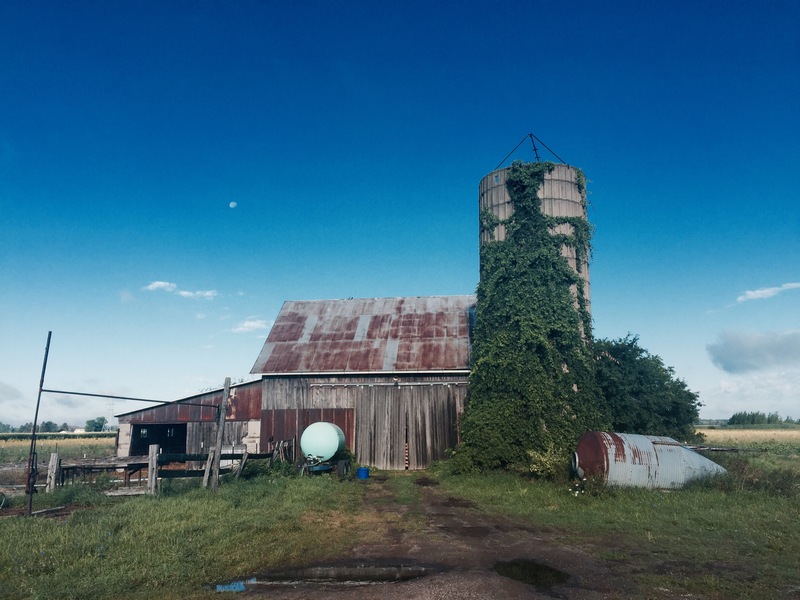 Three miles has never seemed like such an insurmountable task. And why would a campground not allow tent campers? Is there really that much money in seasonal RV campers that you can turn your nose up at a few bucks every now and again at a tent? I guess so. Anyway, we pushed through our jelly legs to make it to the campground that would let us sleep there. Oh. Excuse me. Kampground. That’s right. We spent the night at a KOA. And not just any KOA, but a KOA resort. That means there was a pool, sports courts, an exercise room, a big inflated rubber jumpy thing for kids, and several different levels of fanciness for RV campsites. What it meant for us is that they wanted us to pay $34 to sleep on the ground in a big, treeless field next to some mosquito breeding grounds wetlands on the outskirts of the resort. At least we were able to talk them into giving us a $5 discount. We set up our tent and showered, and then it was time to heat up our soup and eat. But holy moly those mosquitoes. They weren’t at all bothered by our bug spray or our long-sleeve shirts. They kept on snacking away. We eventually put on our rain coats and pants, and that kept them mostly at bay. A few of the more persistent buggers kept trying to bite Dani in the eyeball, though. We gulped down our soup, washed up, brushed teeth, and fled to the sanctuary of our tent as soon as possible. Tomorrow’s another long day, but it’s the day we finally become international touring cyclists! Canada!